Pulsar manufacturing information | AccSys Technology, Inc. The PULSAR® PET Isotope Production systems are linac based proton accelerators designed to replace large and demanding cyclotron systems for the production of positron emitting isotopes. Sufficient amounts of fluorine-18 and carbon-11 can be produced for synthesis into compounds used in oncology, cardiology, neurology, and molecular imaging. The radio-labeled glucose analog, FDG, can be synthesized and distributed for use in Positron Emission Tomography. PULSAR® linacs offer highly flexible productivity. High-production single targets or multiple target configurations are available. PULSAR® 7 system with shield. The PULSAR® 7 system which is 7 MeV model represents the next generation in reliable, cost-effective positron isotope and tracer production. It is a rugged, reliable, high performance system that assures unparalleled operational and upgrade flexibility at the lowest available life-cycle cost. The PULSAR® 7 takes advantage of the rf proton linac system’s compactness, light weight, ruggedness and simplicity of operation to deliver high reliable 18F-FDG production at the lowest possible cost. AccSys Technology's PULSAR® product line represents the next generation of positron radiotracer production equipment. Combined with commercially available synthesis boxes, the PULSAR® system can produce enough FDG for in house use and for distribution to other imaging centers. Efficient, cost effective, and reliable production of molecular tracers is now available with the PULSAR®. Life-cycle cost includes facility costs and annual operating expenses as well as the equipment purchase price. Life-cycle cost is the truest measure of the price of ownership. PULSAR® systems are compact, light weight and easy to install. They also do not require stringent environmental control of the area in which they are housed. This minimizes the cost and complexity of facility planning and construction. The modular, self-shielded accelerator, target and chemistry systems provide unprecedented flexibility in siting options. The PULSAR® 7 linac can usually be placed in an existing site. Ease of operation, low power consumption and minimum maintenance costs assure the lowest operating cost of any comparable positron tracer production system on the market. Linacs have high residual value as opposed to cyclotrons. No decommissioning is required since the target system is shielded in ALL directions. A complete PULSAR®-based positron radiotracer production facility can occupy less than 1,000 ft2 to make the most efficient use of valuable space. A complete mobile system, including the tracer production laboratory, can be provided in a standard 48 ft trailer from Medical Coaches. Compact size, light weight, less radiation and ease of installation mean that purchasing or leasing a PULSAR® system reduces installation time and minimizes the need for a costly special facility. Based on proven rf ion linac technology, the PL-7 proton accelerator used in PULSAR® systems is similar in operation and reliability to the rf electron linacs that have been used for three decades in cancer radiation therapy. An AccSys proton linac has been operating reliably as a critical component of the Loma Linda University Proton Cancer Treatment Center where patients have been treated since 1990. 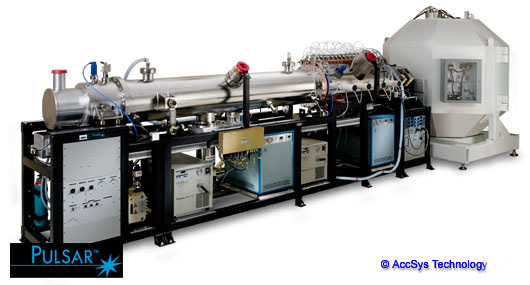 PULSAR® isotope production targets and chemistry systems have been developed under joint research and development agreements between AccSys and some of the world's leading medical isotope production and radiochemistry research groups, such as the PET chemistry group at Brookhaven National Laboratory. These ongoing, long-term collaborative relationships will continue to provide precision, high performance targets and radiotracer synthesis units that are efficient, reliable and easy to use. The first PULSAR® 7 PET Isotope Production System has started the operation in April 2004 at Hitachi General Hospital in Japan and is showing the good performance. The first Mobile PULSAR® 7 PET Isotope Production System had shipped to Israel and has started the operation in November 2007. Each PULSAR® system provides the ideal combination of beam energy and target current, making it the most compact, cost-effective solution for the production of positron isotopes. PULSAR® systems streamline the entire process of positron radiotracer production: from early morning start-up to the last run of the day. Simplicity is a PULSAR® linac hallmark that sets the product line apart from other more complex positron radiotracer production equipment. The PULSAR® control system features built-in control units that enable a high level of automation and hardware protection. The operator performs set-point control, automated start-up and monitoring of routine system operation. The control system incorporates a highly intuitive, graphical user interface running on a standard PC. Total automation of PULSAR® units assures consistent availability of needed radiotracers. Fluorine-18 is produced in the form of fluoride ions and the rapid, high-yield nucleophilic displacement method is used for the synthesis of FDG. Maintenance of PULSAR® systems is very simple. The linear configuration assures easy access to subsystems and components. The spherical shielding module opens for improved access to the isotope production targets. The high beam transmission efficiency of the PULSAR® linac assures low radiation dose rates during machine service. The simple, modular design of each PULSAR® system reduces the number of replaceable components. PULSAR® systems are available in a number of standard models to suit the widest range of positron radiotracer production needs. The use of modular subsystems allows unequalled flexibility in upgrading the features, functions and performance from PULSAR® 7 system to PULSAR® 11 system and higher energy systems. You only purchase what you need now. As your needs change, your PULSAR® model can be reconfigured to meet your new requirements. No other product on the market offers this degree of flexibility and range of upgrades. A Mobile PULSAR® 7 PET Isotope Production Lab consists of a PULSAR® 7 system, the chemistry modules needed to produce FDG, Laboratory equipment for the quality assurance of radiopharmaceuticals and the Medical Coaches Trailer that contains linac room and laboratory area with clean room for manufacturing, dispensing FDG and chemical handling. 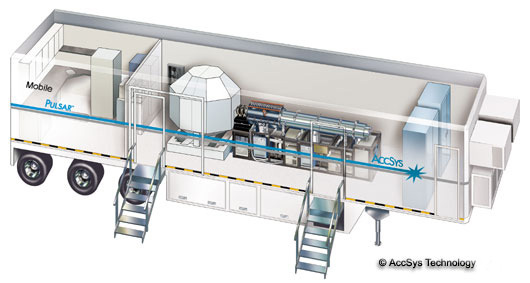 The standard Mobile PULSAR® 7 PET Isotope Production Lab is illustrated in figure below. The Mobile PULSAR® is the only truly mobile PET lab available. This unit can be parked in an existing parking lot or located on a pad provided with a shore power hookup. Relocation of this system is as simple as driving away. If space is a premium or you want a truly relocatable PET Isotope production facility, then the Mobile PULSAR® is the only choice. Faster startup – Once the equipment is installed and tested, it is ready to go! No bonding for decommissioning – targets are completely shielded and relocation is simple. Compact space – does not require expensive lease of hospital or imaging facilities floor space. No one else can provide a truly Mobile PET Isotope Production Facility!